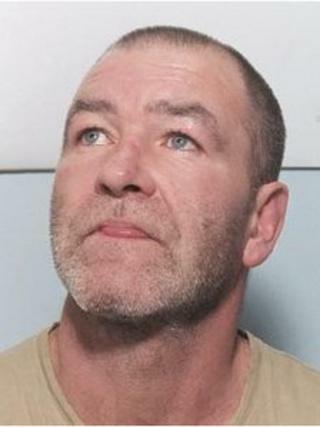 A search has been launched for a 47-year-old inmate who failed to return to a prison near Dundee following leave over Christmas. Raymond Byrne was due back at HMP Castle Huntly on 27 December after being granted temporary release to his home town of Irvine. Byrne was sentenced to 54 months imprisonment in May 2011 after being convicted of assault. He is described as being 5'8" tall, with grey/white receding hair. Tayside Police said he also has a scar on the bridge of his nose and tattoos of a matchstick man, a flower and a cross on his arms. He is also missing the little finger on his right hand. The force said they had received a confirmed sighting of Byrne in Irvine town centre on Thursday. At the time he was wearing a white-coloured Celtic away football shirt, dark blue jeans, and a dark blue-coloured checked jacket. He was also carrying a blue holdall. Anyone who thinks they may have seen the 47-year-old is asked to contact Tayside Police.